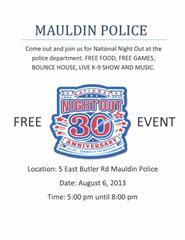 Mauldin's National Night Out 2013 will be held at Mauldin City Hall tomorrow night (Tuesday) from 5-8pm. Lots of free food, games for the kids, K-9 Demos, and public safety information. Plus, the Mauldin Police Department Community Services Hum-Vee will be making its debut. We would love to have you come out and spend the evening with us!